Abies alba 'Bystřička', spelled 'Bystricka' in the English language. One of the smallest selections of European silver fir currently available to the conifer collector. The needles of this treasure are tiny and light green. The branching is tight and regular, growing only 1/2 - 1 inches (1.25 - 2.5 cm) per year. The overall shape is bun- or cushion- shaped. After 10 years of growth in the garden, a specimen may only be 8 inches (20 cm) tall and only slightly wider. 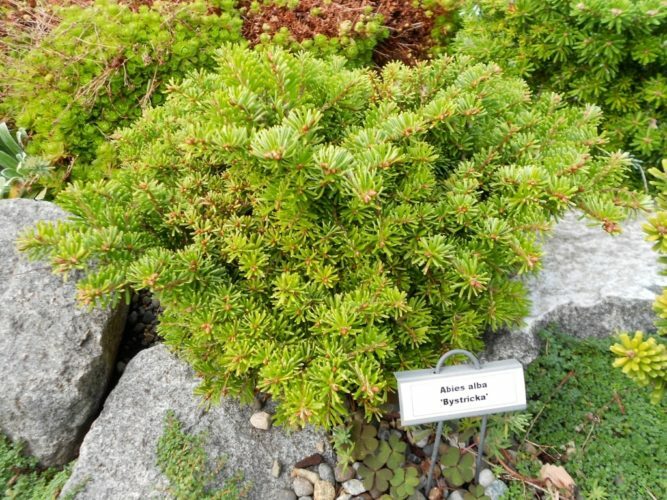 'Bystřička' is a perfect choice for planting in the rock garden or an alpine trough landscape. Considering its diminutive size, it will likely never outgrow its given space in the garden. Jiří Rádl discovered and named this cultivar. He selected it from a witch's broom growing on a species tree in the Czech Republic in 1996. Bystřička is a village and municipality in Vsetín District in the Zlín Region of the Czech Republic. It can be assumed that is where Mr. Rádl found the original broom. Abies alba 'Bystricka' at Glacier's End Arboretum, Olympia, WA. When this photo was taken in 2013, this 10 year old plant was approximately 5 inches tall by 8 inches across.